The president made the announcement at a White House meeting with Secretary of Commerce Wilbur Ross and industry executives. 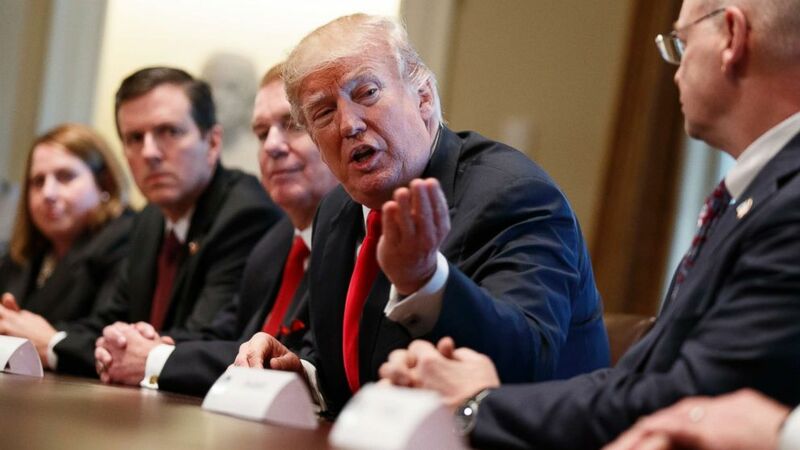 President Donald Trump announces that the U.S. will impose tariffs of 25 percent on steel imports and 10 percent on imported aluminum during a meeting at the White House in Washington, March 1, 2018. One aluminum company executive said his industry has lost jobs due to unfair competition that’s led to a lack of investment. “We need a level playing field or we are going to lose our manufacturing infrastructure and the national security issues that surround having a vibrant, capable manufacturing sector,” John Lapides, CEO of United Aluminum. Wall Street’s reaction was sharply negative with the Dow closing down more than 400 points, with traders concerned that a company like General Motors will have to pay more for the steel and aluminum in its cars and trucks, likely passing on increased costs to consumers. And Trump’s announcement faced an immediate backlash on Capitol Hill, notably coming from an unexpected quarter: his Republican allies on Capitol Hill. “Tariffs on steel and aluminum are a tax hike the American people don’t need and can’t afford. I encourage the president to carefully consider all of the implications of raising the cost of steel and aluminum on American manufacturers and consumers,” Hatch said in a statement. Hatch, as chairman of the Senate Finance Committee, authored the legislation to overhaul the nation’s tax code policy, which the GOP has touted as a tax break for the American people. “The president’s announcement that he plans to levy higher taxes on materials that Wisconsin’s manufacturers and consumers purchase is concerning. I plan to work with my colleagues and the administration to ensure fair, robust trade policies that protect our state’s workers and consumers,” Johnson said in a statement. “Changing course from this approach by invoking national security as a means of imposing new, huge tariffs on all kinds of imported steel is a big mistake that will increase costs on American consumers, cost our country jobs, and invite retaliation from other countries,” Toomey said in a statement. Thursday’s announcement came after a morning of confusion at the White House about whether the announcement would occur at all. Just hours before the meeting, different White House officials offered conflicting guidance about whether the announcement was set to happen Thursday. It follows a Commerce Department review of steel and aluminum imports and comes after the president signed executive actions in January approving new tariffs on imported washing machines and solar panels. There are concerns that the move could spark a potential trade war, with other countries reportedly weighing whether to retaliate against the Trump administration’s protectionist move. Even as the president accused other countries of ruining the U.S. steel and aluminum industries, he made clear that he doesn’t blame those other countries for the current situation, but instead pointed to decades of U.S. trade policy. President Donald Trump speaks during a meeting with steel and aluminum executives in the Cabinet Room of the White House, March 1, 2018, in Washington. The president tweeted earlier on Thursday to complain that the industries have been “decimated” by unfair trade practices. April 5, 2019 Comments Off on The New Equifax Boss Wants to Make Amends. We Have Some Questions.